With the widget loaded on the page, the next step is to just wire an element’s click event to the function contactWidget.OpenDialog. 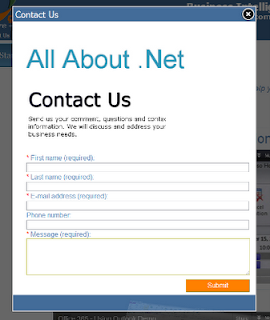 This opens the modal dialog and displays the contact form. Step six handle the back button on the thank you page. The form displays text instead of the actual anchor tag. This is because the default output for the XSL transformation is to escape special characters. To address this, we need to modify the XSL template and force the output to render the HTML instead of displaying it as text. This can be done by adding the disable-output-escaping attribute to the xsl:value-of tag. Save your changes and refresh the page. The link should now be displayed as shown below. 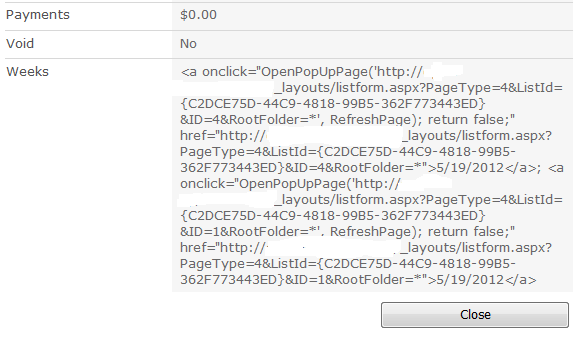 A multi-value field column in a SharePoint list allows us to store multiple look-up ids. 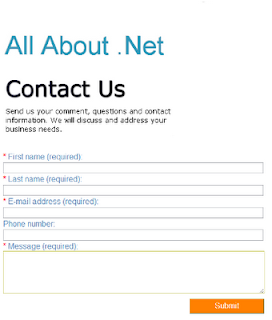 This is an alternative to creating a separate list that has a one-to-many association. For example, an invoice item that needs to be associated to one ore more time entries. For this example, we could define an invoice list with a lookup field that can hold multiple values. We use a field array to define all the controls and fields that need to be processed. The HTML controls have their ids set to the field names. This allows us to map the controls to the fields. The IF statement is used to check for the field that has the multiple lookup values. When this field is encountered, we read the value of the Multi-Select list which returns an array of ids. For each id, we create a FieldLookupValue instance and set the lookup id using the set_lookupId method. Each FieldLookupValue is then pushed into the timeEntries array. The last step is to set the item value by calling set_item and passing the array of FieldLookupValues. The call to item.update() sets the query to execute. To post the changes, we call executeQueryAsync and pass the OnSuccess and OnError handler to validate that all went OK or if an error needs to be handled. It looks like our project is set to use jQuey 1.5.1, but the package has a dependency on jQuery 1.6.4. We need to look at how our project is configured. Look at the packages.config file in the project. This file is a NuGet configuration file which is used to track the packages and version. This file is used when we attempt to configure a project using the NuGet commands. It looks at the file, and it checks to make sure that what you want to do does not cause any possible conflicts. 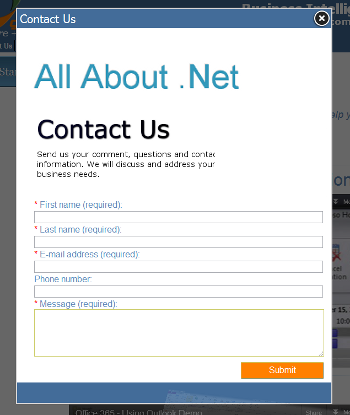 In our case, we can see that the project is set to use jQuery 1.5.1. We need to update this setting to be able to import this package in our project. 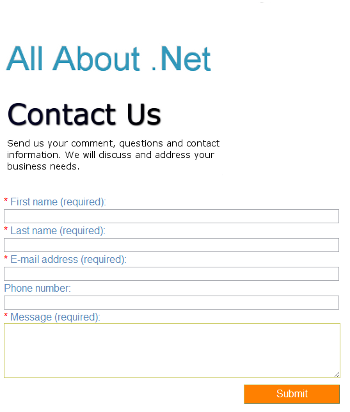 We also need to make sure that the new jQuery reference is added. Remove the reference to jQuery (first two lines) from the file. Save the file and on the Package console run the command again. install-package signalr. You should now see messages indicating that the file was correctly installed. 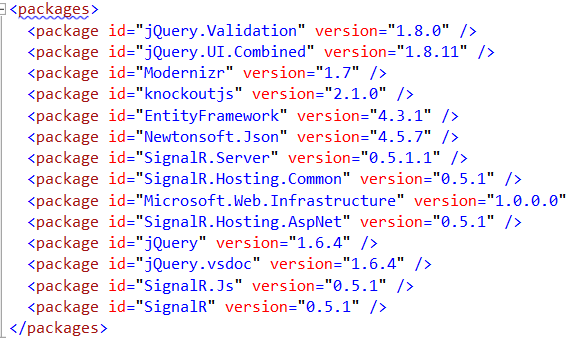 If you check the file again, you will see that the file is now upgraded with the new jQuery and the signalr files. You should also look at the Script folder, and you will see that the jquery-1.6.4 files as well as the jquery.signalR js files have been added. You know just need to make sure to remove the old jquery (1.5) files, and you should be ready to continue.